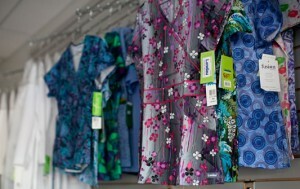 We recognize that medical scrubs and uniforms play a vital role in the patient experience at healthcare facilities. A well-defined uniform package will create a professional first impression, deliver trust and credibility, and help make employees easily distinguishable to hospital patients. **Call us today and let one of our representatives help you to design a medical scrub and uniform program, and show you how to fully utilize our industry solutions for your facility.